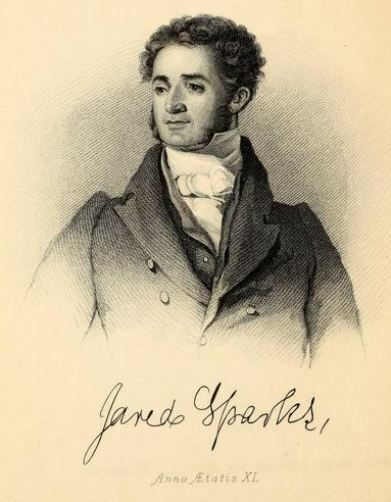 Jared Sparks was a Unitarian minister, editor, and historian who went on to serve as President of Harvard University in the middle of the 19th century. Perhaps the greatest contribution to modern scholarship made by this passionate researcher and educator was his tireless efforts to collect and preserve the documents of America’s founding fathers. Born in 1789, Jared was one of nine children born to Joseph and Elinor Sparks of Willington, Connecticut. At the age of six his parents sent him to live with an aunt and uncle in Camden, New York, as a way to ease the family’s financial burdens, but he soon returned to Willington to be with his parents and pursue his education. As a child he displayed an interest in literature and history, supplemented later by studies in mathematics and Latin. In 1811, Sparks began attending Harvard University. He briefly dropped out the following year (for financial reasons) but eventually returned to Harvard and became one of the leading students in his class. After finishing at Harvard, Sparks became a minister at the First Independent Church (Unitarian) in Baltimore, Maryland, and later served one year as the chaplain of the United States Congress. Sparks returned to Boston in 1823 and, four years later, began collecting the papers of the nation’s founding fathers. His efforts led him to author numerous publications, including The Writings of George Washington, The Library of American Biography, and The Works of Benjamin Franklin. These works, by preserving this seminal time in American history, marked his greatest contribution to historical scholarship. In 1832, Sparks married Frances Ann Allen, and one year later, Frances gave birth to a daughter—Maria Verplanck Sparks. Tragically, Frances died in 1835, leaving Sparks to raise their two-year-old daughter alone. In 1839, he married his second wife, Mary Crowninshield Silsbee, a woman 20 years his junior with whom he had five more children. A year before his second marriage, Sparks accepted a position as the McLean Professor of Ancient and Modern History at Harvard University. He remained an educator there until, in 1849, he became president of the university. Finding he liked teaching and writing more than being an administrator, Sparks left his prestigious position in February of 1853. He spent his remaining years in Cambridge, researching and providing guidance to budding young historians. He died of pneumonia on March 14, 1866. “Jared Sparks.” Harvard University, 2013. Link. Sparks, Jared. The Life and Treason of Benedict Arnold. Boston; London: Hilliard, Gray ; R.J. Kennett, 1835. Link.